SPOILERS FOR THE FIRST EPISODE OF KRYPTON. Kem, El and Zod. Sounds like an alien law firm. I read the Last Days of Krypton by Kevin J. Anderson a few years back. It's the story of Jor-El and General Zod and their fight to save their planet from destruction. I enjoyed it. 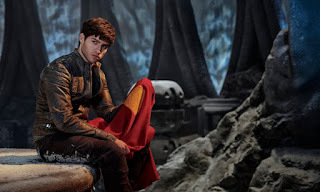 It was interesting to gain a little more insight on the planet Krypton, Kryptonians and characters that are key to Superman's story but don't always get the full rundown. 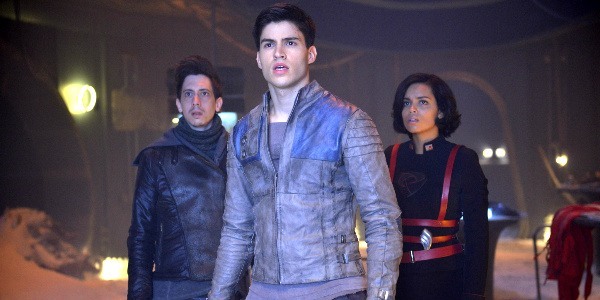 I thought when SyFy announced this Krypton series it would be the book. I was wrong. I saw the advertising for the series it was bright and very old WB and CW non-Dc series like. It seemed to be a lot of young people being pretty and emoting in majorly dramatic ways. I thought it would be Riverdale in space. I was wrong. But I was also right and that's not necessarily a bad thing. 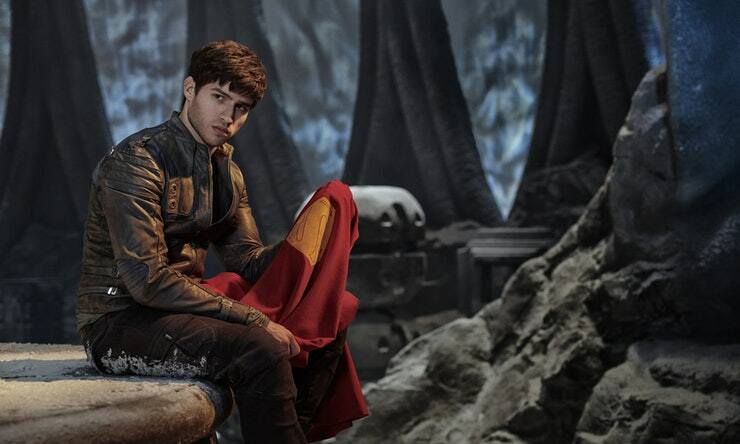 Krypton is the story of Seg, the grandfather of Superman, and how he restores the name of El in Krypton's history. 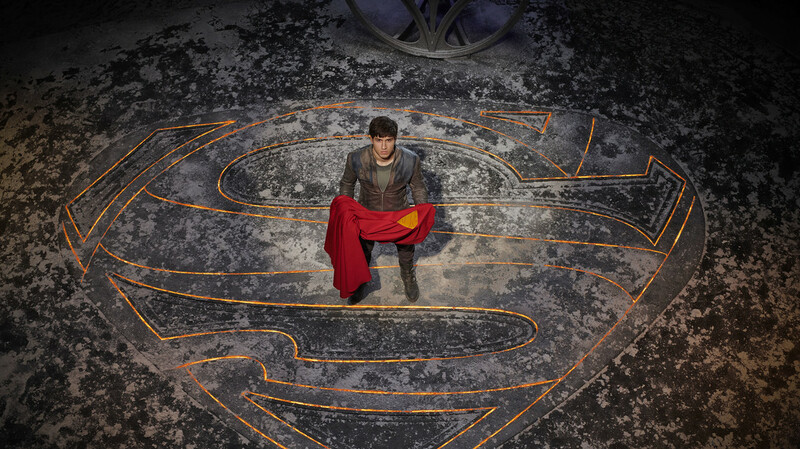 The show begins fourteen cycles/years prior when a young Seg is witness to his grandfather's execution and his family's name being "erased" from Krypton. Val-El, Seg's grandfather, is convicted of the crime of basically heresy. 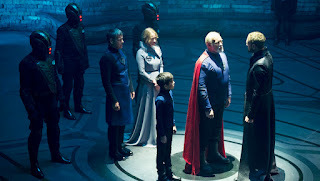 Krypton has become a bit of a theocracy with the ruling Council being led by the silent, masked leader The Voice of Rao. Val-El is from the Science Guild and is trying to spread the fact that he knows that Krypton isn't alone in the universe. On top of this, the planet needs more than faith in their god and sun Rao to be protected from possible external threats. 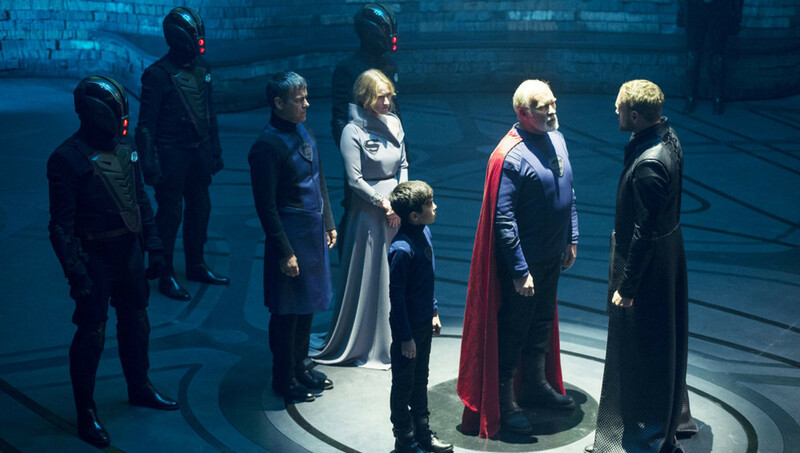 This doesn't sit well with the Voice and the Council so Val is sentenced to death, his family's name is stripped making them Rankless, the lowest caste in Kryptonian society, and no one in their family is allowed to be a member of any Guild. Fast forward to present (past?) day Krypton and Seg is now a young man who hustles money with his friend and bar owner Kem in fights to help his family survive in the lower levels of Kandor City where the Rankless reside. His parents aren't happy with this arrangement but can't do much to fight against the system as it stands. Seg is also in a secret relationship with Lyta-Zod, a character with a familiar name who is in the Military Guild led by her mother Jayna. Lyta unfortunately is of Rank and is occifically betrothed to fellow Military Guild member Dev-Em. They will have a Binding ceremony in a few weeks, which is the way Kryptonians marry now. During the course of events, Seg's father forgets his medication and Seg goes to the Law Maker Guild to give it to him. A member of the terrorist organization known as Black Zero is about to attack the Voice of Rao and Seg stops him. This act of bravery makes Daron-Vex, the Chief Magistrate and man who sentenced Val-El to death, give Seg permission to marry his youngest daughter Nyssa and gain a Ranking position in the Science Guild and share his surname. While this is going on, a stranger appears to Seg wearing mysterious clothing and gives him a crystal key with his family's old sigil on it and warns him of danger from the future. He tells Dev he must find the lock for the key to save his grandson, Superman. The stranger's name is Adam Strange, a time traveler from a planet called Earth. That's Chris Reeves' cape by the way. We soon learn the crystal key is an object called a Sunstone and that his parents have been keeping a secret from him. On the run one night from Military Guild officers called Sagitarri, Seg is rescued by his mother in a stolen ship. They escape out of the dome of Kandor City and arrive at a place that looks familiar. It is the Fortress of Solitude from Superman lore but the original version on Krypton. Seg's grandfather had been using it as a secret laboratory and Seg discovers his grandfather was telling the truth. Seg and his mother have to leave because someone notices the vehicle they stole is missing. They arrive back in time and Seg's mother hides him while she is arrested by the Sagitarri after lying and saying she is allied with Black Zero. At the trial, it is revealed that they know someone else was in the ship with Seg's mother, Charys. To protect Seg who is about to confess, his father, Ter, says he was the passenger. A struggle ensues and both of Seg's parents are shot in the chest and killed. 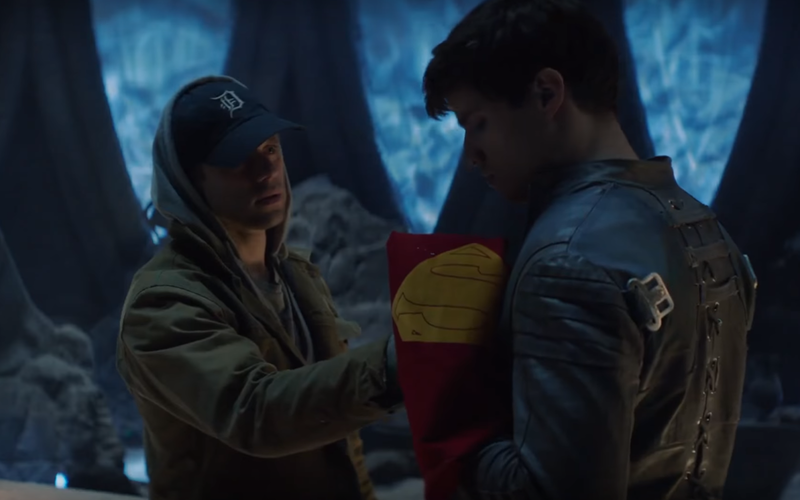 (This made me actually think of Superman's crest's location on his costume but I'm not sure if that was intentional) Seg leaves the heights of the city of Kandor and returns to the Rankless bottom to find his friend Kem to ask for help. Kem gives Seg a ship. Seg returns to the Fortress where he meets Adam again. Adam gives Seg Superman's cape which is dissolving slowly because time is running out for the future. The approaching threat to Krypton of the past is the Collector of Worlds. Brainiac is coming to get rid of Krypton before it can give the universe its greatest protector and his greatest foe- Kal-El aka Superman. This show has potential. It isn't a bad premise to base a show on and, although, I'm assuming we know how this will all play out, the ride could be interesting. There is some connectivity to certain elements of Superman lore, especially the look of Man of Steel because both are the handiwork of David Goyer. Your mileage on this may vary but it is a solid foundation, even if we get Genesis Chamber talk. The three main Guilds are established in this pilot along with the ideas of city states so we may see interaction further during the series, the Rank and Rankless caste system is put in place and the four main families- El, Vex, Em and Zod- have been introduced to begin to get the pieces laid out on the board. We are also introduced to characters whose motivations are known and unknown, including Jayna Zod, Nyssa Vex, Chief Magistrate Daron-Vex and the silent Voice of Rao. What are their goals? What are they up to behind the scenes? We have familiar concepts like the Fortress of Solitude and the Black Zero organization. 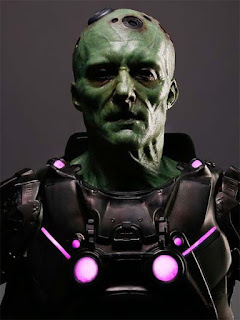 On top of this, Doomsday and Hawkgirl have been rumored to appear at some point in the series and Brainiac is DEFINITELY on his way. I do have three main gripes about this show from what limited footage we have seen. First is the character of Adam Strange. Don't get me wrong, I like Adam but it seems like a, excuse me, strange choice for this role in the story. I get he is the adventurer traveling to the exotic world of Rann via Zeta Beam but I don't think that involves time travel, correct? I have a feeling they wanted a Rip Hunter character but, you know, Legends, so here we are. Second thing is the attitudes of the Kryptonians. They definitely read as more isolationist like Daxamites at this point. That may be the point of the House of El returning to lead the people in the story but I definitely got a more science/explorer vibe from Kryptonians. But, as I said, that may be a story choice and hint at something more sinister with The Voice so we shall see. Finally, and this is something I'm just going to have to deal with, but I hate time travel. I know I complain but I watch stuff with time travel in it a fair amount but there is something about the whole dissolving cape thing that irks me. But maybe it shouldn't. Maybe there is some greater meaning in it. 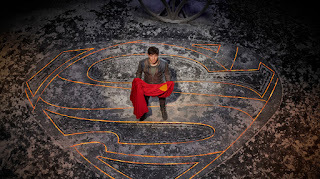 The fact that the cape of Superman with the sigil for the House of El is dissolving means something using Goyer logic. That symbol has been established to mean hope in Man of Steel and Superman is often called the Man of Tomorrow. Maybe the cape is reminding of us to save hope and save tomorrow. The S stands for hope still, I guess. Val-El told his grandson to strive for a better tomorrow before he was killed. Maybe that's the message Seg will passed down to Kal-El and, ultimately, all of us.